If you are a male of a certain age who grew up in America then chances are that you held an issue of Mad Magazine in your hands at some point in your adolescence. 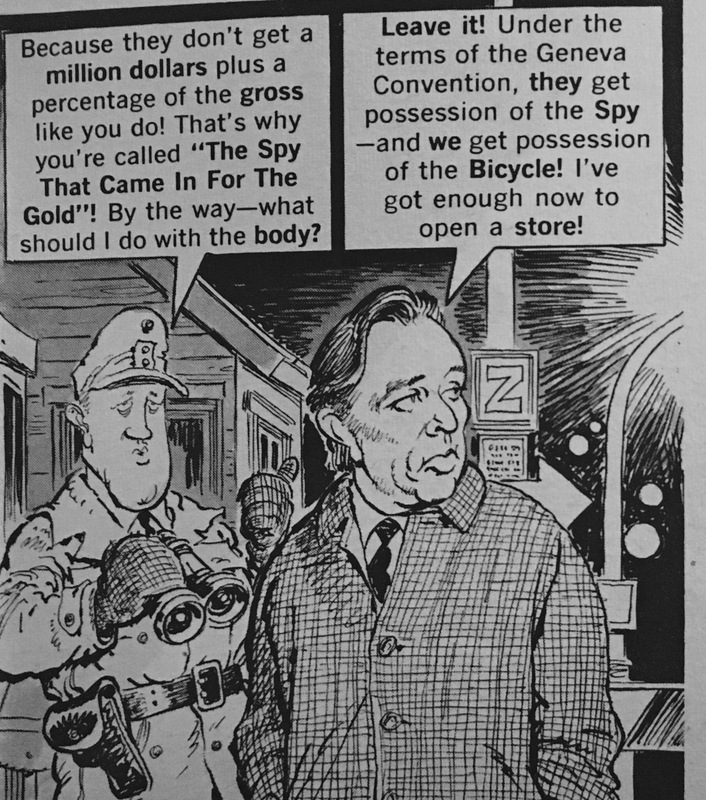 You always knew something was big in the popular culture when you saw it in Mad. 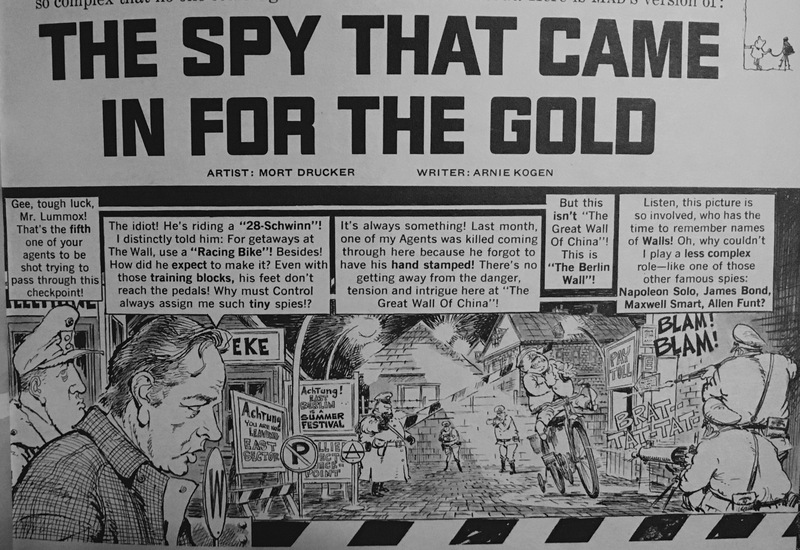 In the September 1966 issue the movie version of The Spy Who Came in from the Cold received the parody treatment with the iconic art of Mort Drucker and writing of Arnie Kogen. The satire is not exactly what I would call biting. 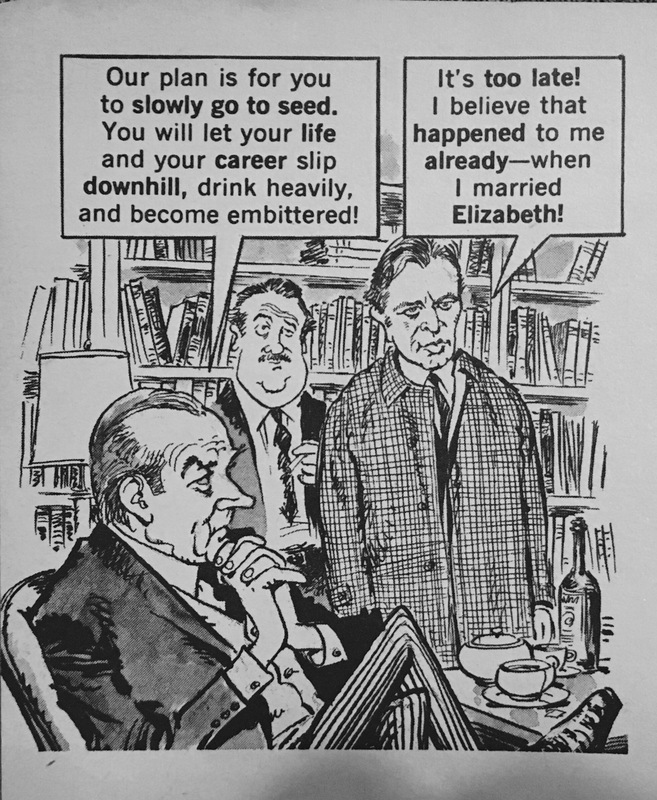 Jokes rest mainly on Liz Taylor and how the plot was too confusing, which is perhaps true for the age of the audience Mad was aiming for. While the jokes are a bit on the lame side, the art is great. Drucker had an amazing ability to capture the look of an actor in caricature form. He and Al Hirshfeld have been probably two of the most well known and best caricaturists. “I’ve always considered a caricature to be the complete person, not just a likeness. Hands in particular have always been a prime focus for me as they can be as expressive of character as the exaggerations and distortions a caricaturist searches for. I try to capture the essence of the person, not just facial features… I’ve discovered through years of working at capturing a humorous likeness that it’s not about the features themselves as much as the space between the features. We all have two eyes, a nose, a mouth, hair and jaw lines, but yet we all look different. What makes that so is the space between them. 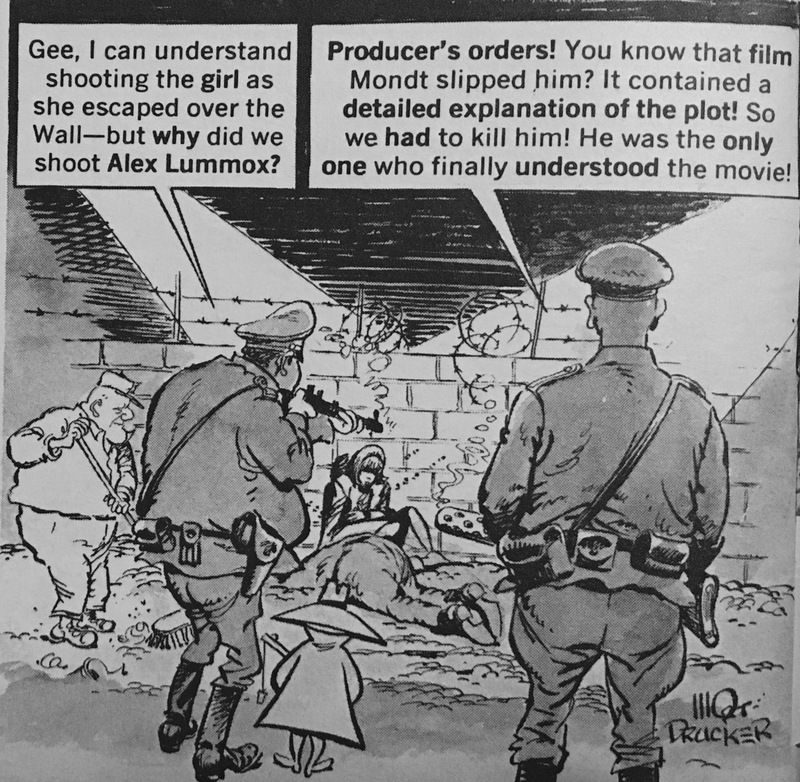 The artist is actually creating his own storyboard for the film. I become the “camera” and look for angles, lighting, close-ups, wide angles, long shots– just as a director does to tell the story in the most visually interesting way he can. Is this even a joke? Obviously Drucker didn’t think so. He stuck every other spy of the moment in there to try and distract us. It makes for a fun spy moment. 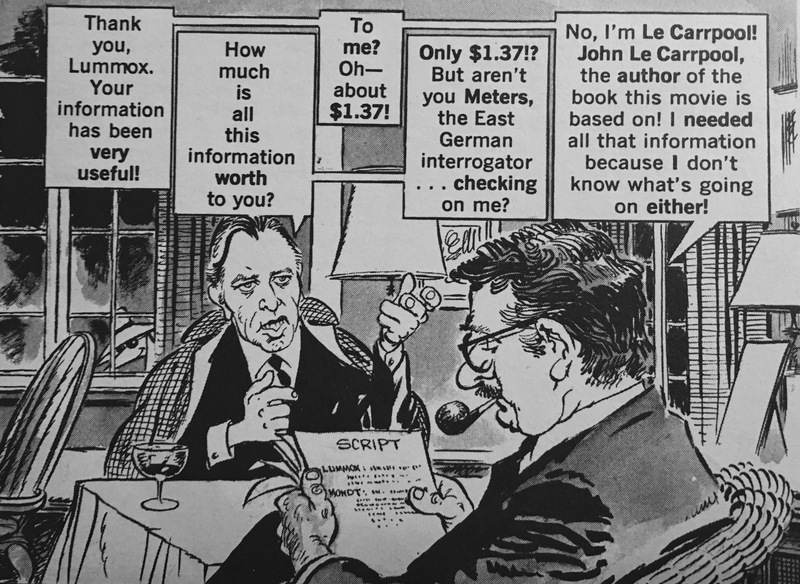 Le Carré gets a mention. If they’d actually used his likeness I would have given them bonus points. I’ve cut out a quite a few panels, but I imagine you get the idea of what they were going for. 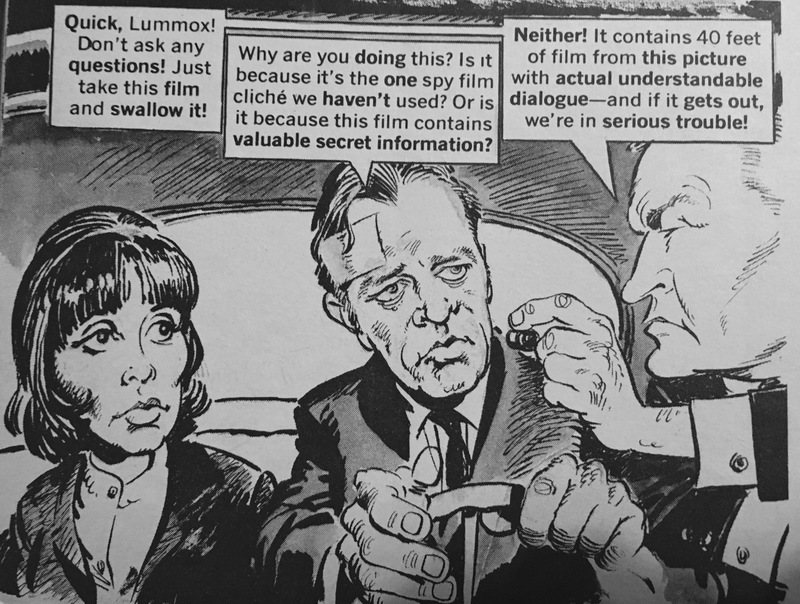 Although many of the jokes fall flat, the art really is great. 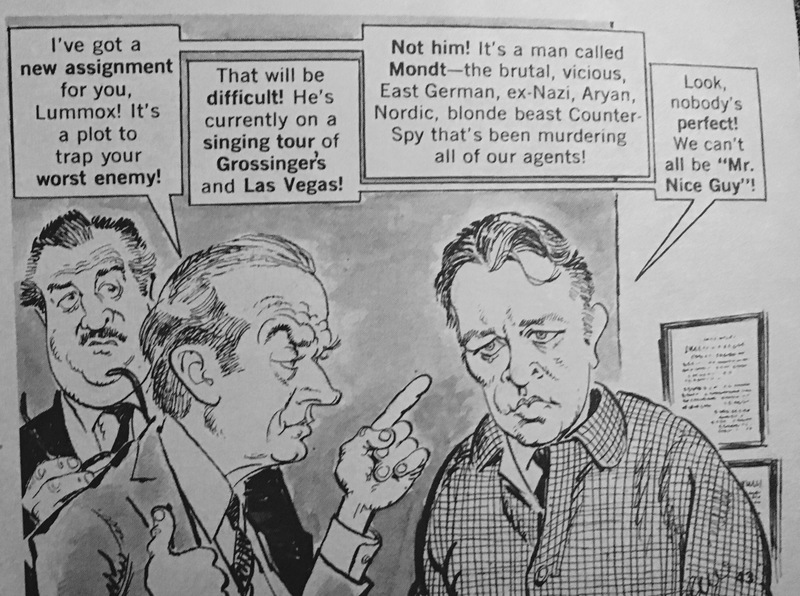 As far as I can tell, this is the only time a le Carré novel, film or tv program has been parodied in Mad or seen in comic form. 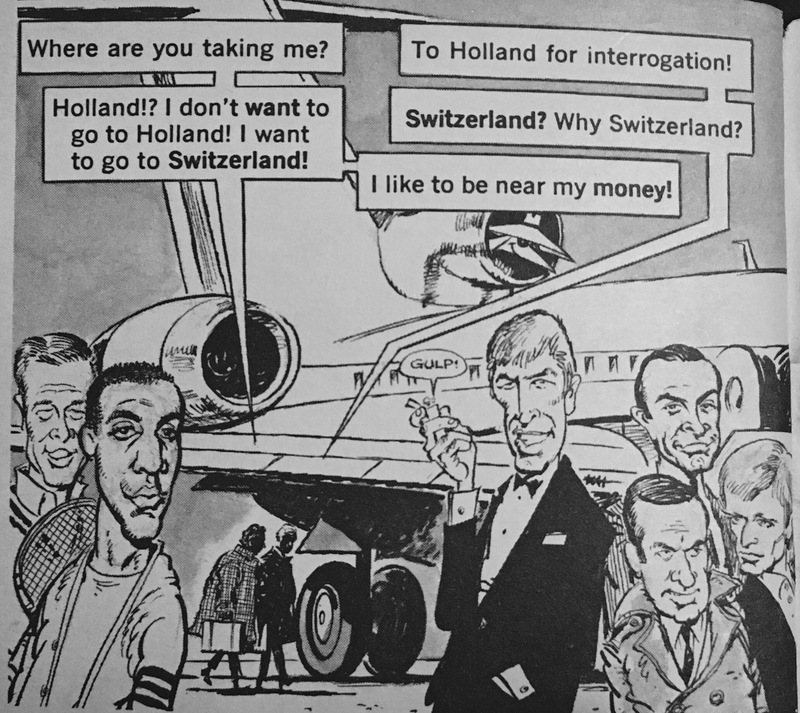 I recently picked up a book on the history of James Bond in comics, for le Carré, this post should cover it. If you are aware of one I’m missing, please let me know!